Create a button that opens a PDF attachment with instructions – this article on How to make a link or button to open PDF attachments can help you get started using this technique. Show/hide form fields containing instructions – Thom Parker’s tutorial on Hiding and Showing Form Fields can help you get started with this. Place instruction on form fields that delete when clicking – Gilad’s discussion on Is there a way to add instructional text to my text field that will disappear when clicked? will help you make this happen. Create a button that turns on/off a layer that contains instructions – Ted Padova’s tutorial can help guide you through this process. Create a button that displays a hidden form field of a PDF page with the instructions – Max Wyss’s discussion details how to do this. I’m going to elaborate on #5 because I’d like to display instructions that are visually appealing and not merely text. So, to start I’m going to log into Adobe Creative Cloud and download some new visual assets that are provided free of charge (for Creative Cloud subscribers) from the Creative Cloud Market. In the Market, I found a graphic that I’d like to use for my instructions. I’m going to place this graphic in Adobe Illustrator and create a one-page PDF of the instructions. 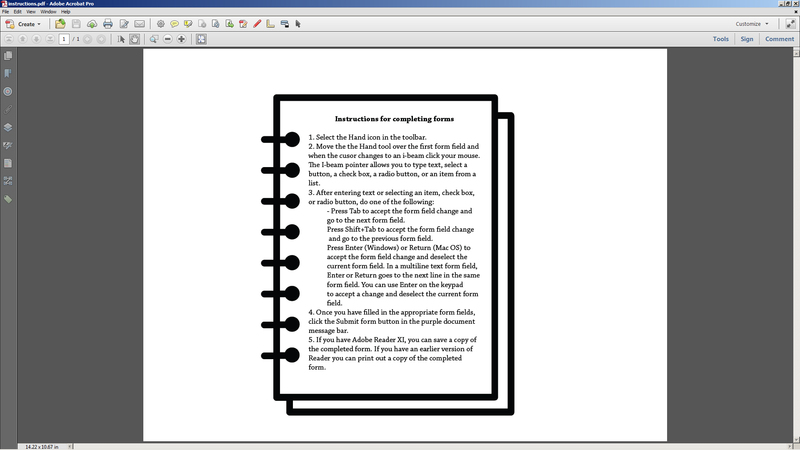 Here is what my PDF instruction file looks like. Click OK and Close the Properties dialog. Next, create another button form field called “instructions” large enough to fit the instructions. Click All Properties and select Hidden from the Form Field: dropdown on the General tab. Under the Appearance tab choose No color for the Border and Fill color. Under the Options tab choose Icon only from the Layout dropdown. 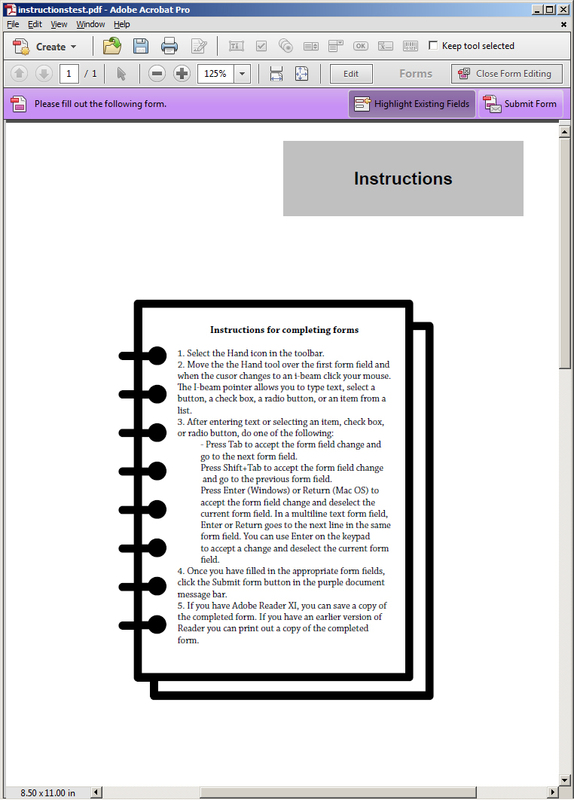 Click the Choose Icon button and select the PDF file with the instructions and click Close. 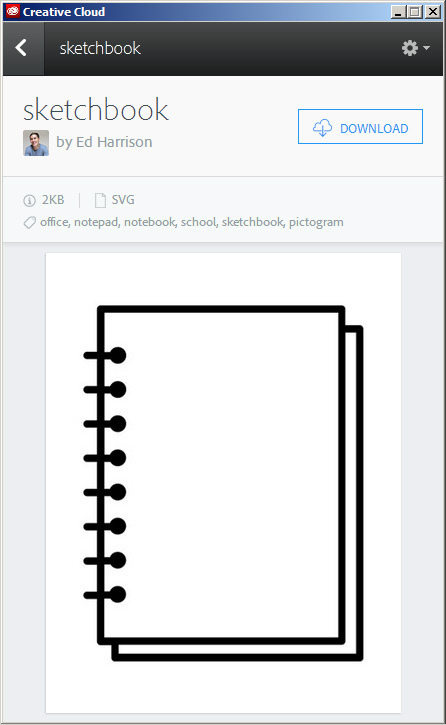 To test, select the Preview button in form editing mode, and click the instructions button.